Since receiving a new camera for my Master's graduation, I have been so much happier with my blog photos. My older recipes, though still awesome in flavor, have sad old pictures taken with an old iPhone... not the best for selling the beauty of a dish! I decided to slowly update some of my older posts that might have been missed by some of my newer readers, or skipped due to their not-so-pretty pictures. 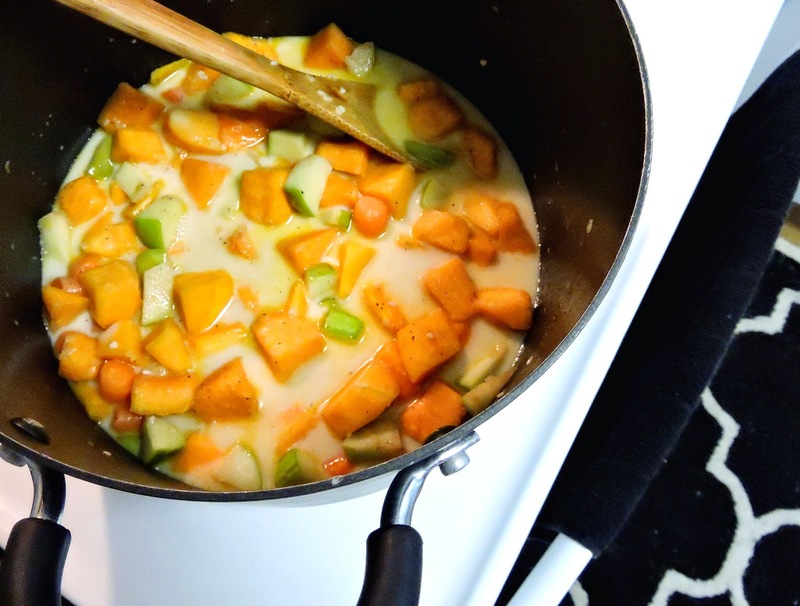 Here's an old favorite of mine that has gotten great reviews... Butternut Squash Soup! I love the sweet, nutty flavor of the butternut squash. I accented it with warm spices like ginger and nutmeg, and gave it a little heat with cayenne pepper. The combination is a perfect balance that will fill you right up. 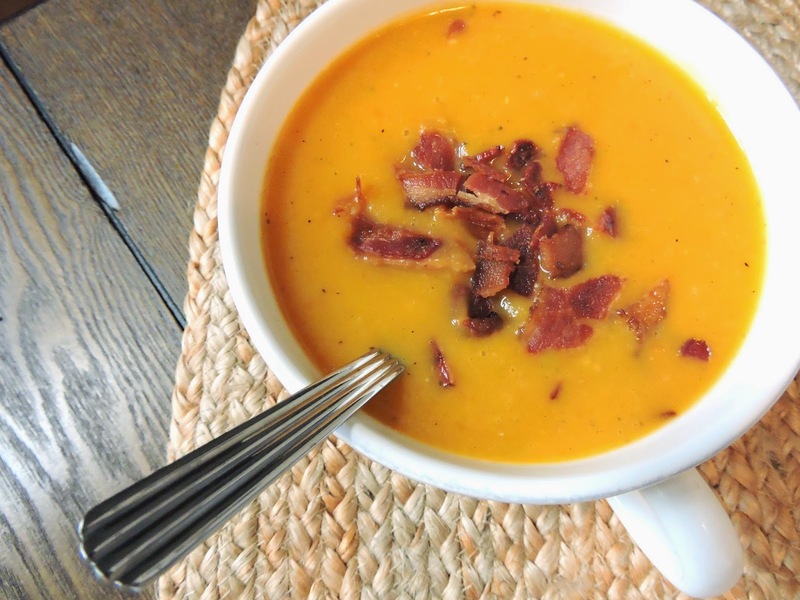 Top it with bacon, & you've got the perfect fall soup. 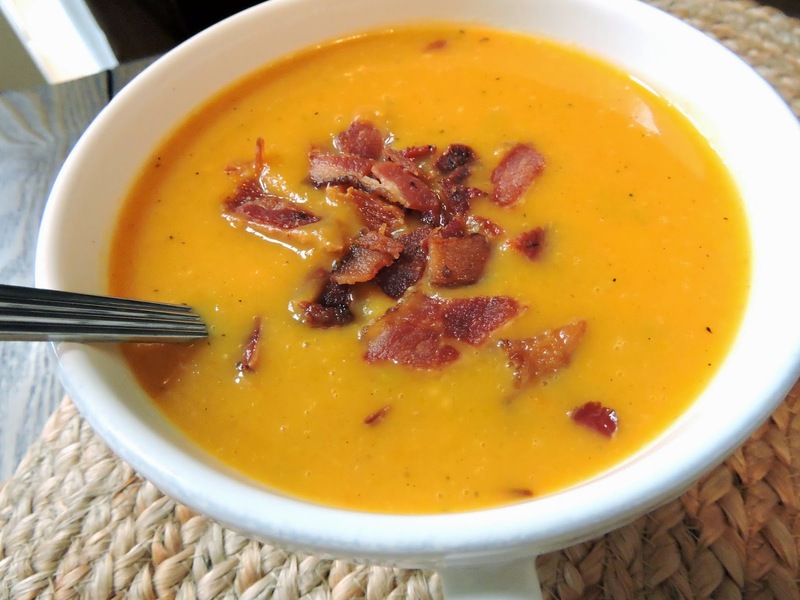 Bacon is awesome no matter what, but especially in this soup. The salty crunch compliments the creamy soup in the best way. This is a perfect meal for entertaining, but also great to make ahead & save for some awesome leftovers throughout the week. It's really easy to prepare; all you need is one pot and a blender or food processor. I buy my butternut squash already cubed and ready to go, which makes it even easier (check Costco for the best value). To top it all off, this creamy, delicious, & hearty soup also happens to be completely Paleo-friendly, and is Whole30 compliant (just be careful with the bacon). In a large pot, heat the coconut oil over medium-low heat. Add the squash, apple, carrots, and garlic, & sauté for about 5 minutes (until the squash is slightly softened; but don't let it brown!). Season with spices, and continue to sauté until the spices become fragrant, about 3 more minutes. Pour in the chicken broth & coconut milk, and bring to a boil. Reduce the heat & simmer for about 15 minutes, or until all of the veggies are tender (test the carrots since they take longest to cook). Serve the soup hot, & top with crumbled bacon if desired. Looks good - I want to try some! I tried it this weekend. It was so good i made it twice! Thanks! Wondering if this would freeze well? I keep seeing the big container at Costco of the precut butternut squash and think I should give this a try! :-) Thanks for sharing! This looks delish! I'm doing another Whole30 in January too, so some quick meals are going to be important! My husband and I love this soup. He requests it often. I put some leftover ham in it....yum, yum. I'm having friends over next Saturday for lunch. Definitely making this. Trying to think what else to give them. Maybe egg muffins and salad ????? Never had the girls over for lunch so want it perfect! Was the squash cooked or raw when you bought it at Costco? On the Whole 30, hubby can't have coconut. Compliant Almond Milk, would that work? This is my go to recipe for butternut squash soup. My husband likes it, too!